At Phoenix International Raceway in November, Chase Elliott, driver of the No. 9 NAPA Chevrolet Camaro for JR Motorsports in the Nationwide Series, wrapped up his championship quest one week ahead of schedule, and joined his Hall of Fame-bound father Bill as a NASCAR champion. Here are the updated Fast Facts, originally published in July 2013, on a young driver with a long NASCAR career ahead of him. William Clyde "Chase" Elliott II was born Nov. 28, 1995 in Dawsonville, Georgia, the son of “Awesome Bill from Dawsonville,” 1988 Cup Series champ Bill Elliott, and his wife Cindy. NASCAR fans watched Chase grow up, including a visit to victory lane and the famed “Yard of Bricks” at Indianapolis Motor Speedway in 2002 at age 6. Elliott’s early years in racing included go-karts, from which he worked his way up to various late model series. In 2009, his first year in late models, he recorded four wins, 24 top 10 finishes and three poles in 31 starts. In 2010, his statistics improved, earning 13 wins, 39 top 10 finishes and six poles in 42 late model starts – those wins included the prestigious Winchester 400 and the first race at the re-opened North Wilkesboro Speedway. When NASCAR lowered the age requirement for its lower-tier series to 15 in 2011, Elliott was signed to a development contract by Hendrick Motorsports, resulting in a full-time schedule in the K&N Pro Series East in 2001 and 2012. In two seasons in the series, Elliott earned one win (Iowa, 2012), 15 top 10 finishes and a pole in 26 races, finishing in the top 10 in points both years. In April 2011, Elliott was named Sports Illustrated’s High School Athlete of the Week. Elliott also ran late models during this time, finishing third in the Denny Hamlin Short Track Showdown in 2011 and winning the prestigious Snowball Derby later that year. In 2012, he ran six ARCA Racing Series races, finishing in the top 10 in each start. In 2013, Elliott competed in the ARCA Racing Series and the Camping World Truck Series. Elliott became the youngest superspeedway winner in ARCA history in June 2014 by winning at Pocono Raceway. In September of the same year, Elliott captured his first checkered flag in the Truck Series at Canadian Tire Motorsport Park in Bowmanville, Ontario. In January 2014, Elliott was announced as the driver of the No. 9 NAPA Chevrolet for JR Motorsports, competing in the Nationwide Series full-time. Elliott won his first Nationwide Series race at Texas Motor Speedway in April in just his sixth start, following it up one week later with a win at Darlington. He would add a third win at Chicagoland Speedway on his way to becoming the first rookie and the youngest driver to win a NASCAR national series title. The Elliotts became just the fifth father-son duo to earn NASCAR titles. 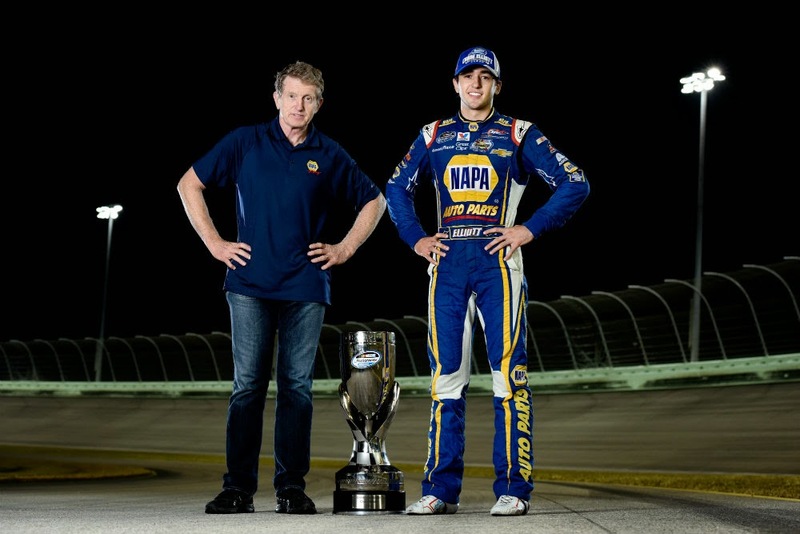 Learn more about Chase Elliott at his website, www.chaseelliott.com.